He wanted a Star Wars birthday party. Perfect, I thought. I love Star Wars. The year before, we decided on a Metropolis-themed superhero party, for which I created a large cityscape out of coreboard and construction paper and glue, and enlisted my babysitter to coat two bags of pretzel rods in white chocolate and sprinkles for party favors. 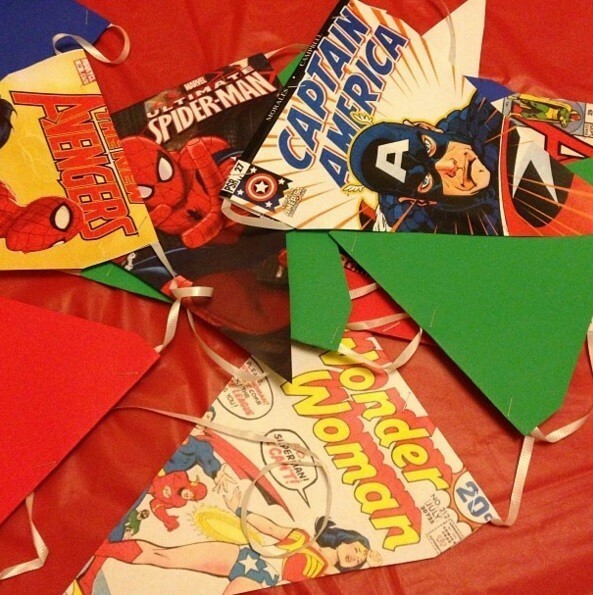 I scoured the internet and printed superhero images pirated from Google, and cut them into triangular banners. The tables were adorned with cupcakes, each with its own little sign that read “POW” or “BAM” or “WOW”. 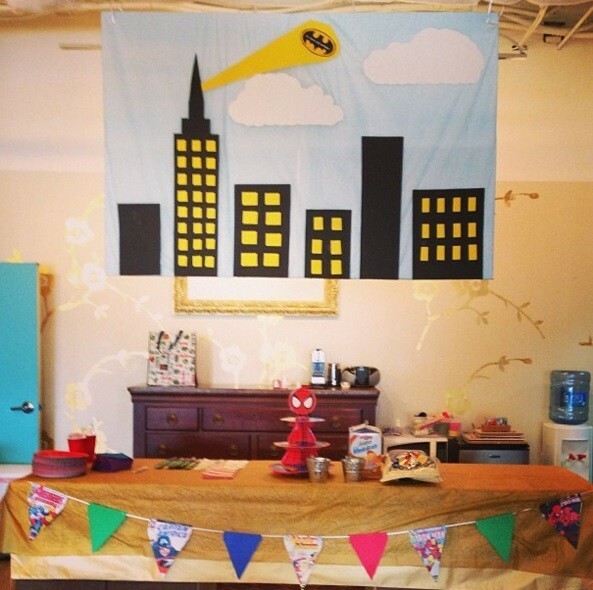 The snacks were poured into comic book pages, rolled into cones and tucked into colorful buckets. I lost a lot of sleep on a four-year-old’s birthday party. And vowed to never do that to myself again. A Star Wars party sounded reasonable this year. I trimmed down the menu and found a park with a huge playset on which the children could spend a couple of hours. What I really wanted were light sabers, about 20 of them. I had seen on Pinterest (STOP TEMPTING ME, YOU BLACK HOLE OF IDEAS) light sabers made from pool noodles and duct tape, and figured that wouldn’t be too difficult. Famous. Last. Words. The problem was that it was September – the end of pool season everywhere. 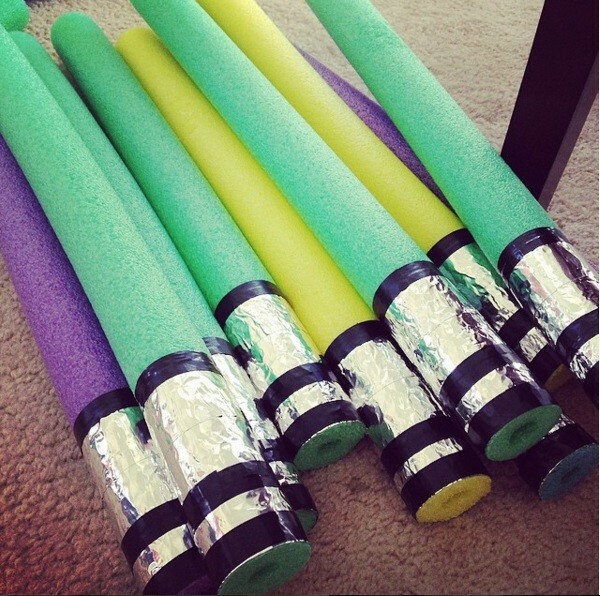 Four stores and plenty of internet-searching time later, I had cobbled together enough pool noodles of various colors and sizes to create light sabers for every kid and sibling who would attend the party. (Yes, of course there was a yellow light saber in the movie! You get what you get and you don’t get upset, kid.) My husband took out the electric saw and we carved each one in half, and then I spent a few evenings wrapping each with black and silver duct tape to give each one a handle. I mean, you can't have a light saber without a handle. We have standards, people. 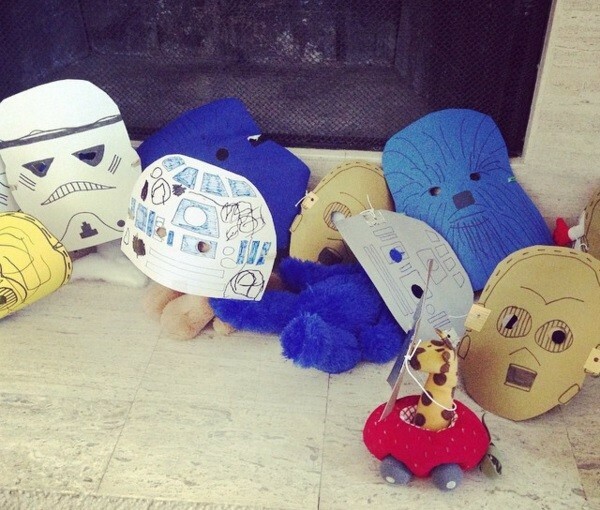 I proceeded to make handmade, hand-drawn Star Wars masks for each child – storm troopers, C-3PO, R2D2, and Darth Vader. And one Chewbacca, but that one looked more like a hippie with a beard than a Wookie. I had to figure out how to attach the elastic that would hold the mask on the children’s little heads; I used rubber bands for the prototypes, and that was messy and didn’t look so great. The craft store people got to know me on multiple trips to figure out the best building materials. Draw, cut, tape, knot. I finished at 2 AM the day before the party. Party Day arrived, and the sun was hot. Flies circulated my homemade cake and snacks, and the Yoda Soda was getting warm. The kids swarmed in like a cloud of locusts, grabbing masks and light sabers and Ewok treats and Seven Leia Dip and headed for the playscape. The kids parried and clashed their pool-noodle-turned-light sabers for an hour without a break, and when Darth Vader arrived (a friend in a costume with his Broncos jersey peeking out under his cape) the party-goers attacked him with glee with their harmless weapons. Then it was a cupcake frenzy and they took their sugar-coated bodies back to the playground for more. It was all laughter and fun and no one cried or had a fit. When the last guest left, two hours later, I was wiped out but exhilarated. Every light saber had been claimed, and his party was a success. 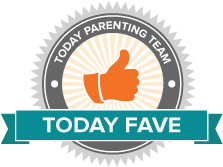 That was so fun, mama! Let’s do that again next time. Next year, we’re going to Chuck E. Cheese. Kristin Vanderhey Shaw is a writer based in Austin, where she is a wife and mother. When she is not chasing her six-year-old mini-Texan, she is a staff writer and director of social media for Airport Improvement magazine. Her personal essays have appeared at The Washington Post; The Huffington Post; Brain, Child; Cosmopolitan; Good Housekeeping, and others. She is entering her third year as a co-producer of the Listen To Your Mother show in Austin. Find her at Twitter @Austinkvs and Instagram @firewheelcommunications.